Hit up Bhavna Chhabria (the store is named after the designer) is stitching up a fashion storm with a mix of Indian and Western clothing. 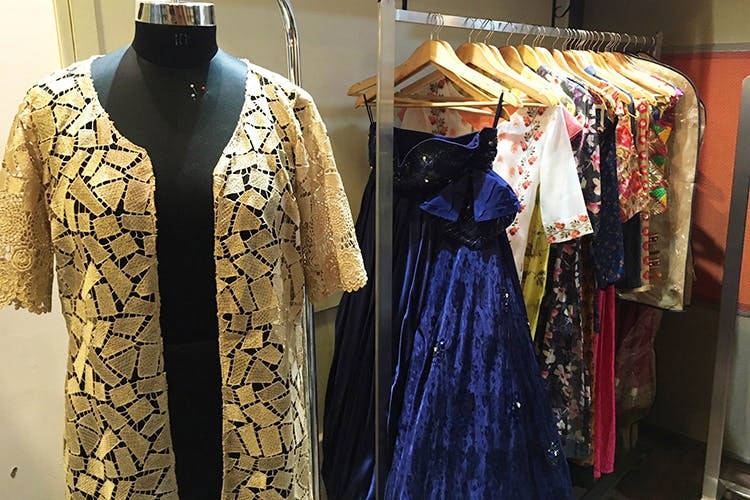 Named after the desginer, the little boutique set up on Indiranagar’s 1st stage (quite close to Milano Ice Creams), has everything from lavish evening dresses to pretty kurtis on the clothing rails. With a sewing machine hiding behind the rails and spools of ribbon and other trinkets stocked on the shelves, this place is armed with all the right tools to create a perfect outfit, whether its a casual get together or your best friends sangeet. Elaborate lehengas, saree blouses, cotton kurtas, maxi gowns and even pretty little skirts are what you’ll find here. Even though they have a few readymade pieces, Chhabria focuses more closely on the tailoring orders she receives. Whatever the design you have in mind, just let her know and she’ll deliver a result you’re sure to be happy with. She loves to work with South Indian cottons, or any textile of your choice, be it silk, satin and even tulle. In fact, she’ll even source the materials and do the embroidery work too. You can find her clothes at stores in Jaipur and Bilwara in Rajasthan, and also at her boutique in Namma Bengaluru. Prices vary from design to design but they start at an affordable INR 1,100. You can get your party dresses and evening gowns sorted from INR 1,600 onwards. What’s more, get a lehenga stitched for an easy INR 2,500 and upwards. Make sure you give your orders around 10 days to two weeks prior and you should have a perfectly tailored outfit ready in no time.